The ensemble launches its 40th season with “Celebration,” featuring six unique and dynamic concerts. 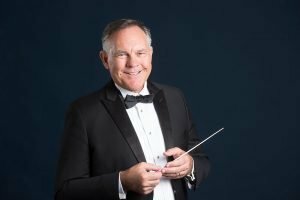 Choral Artists of Sarasota launches its 40th season with more of the innovative programming that has become the organization’s hallmark under the artistic direction of Dr. Joseph Holt. “Celebration” features a series of six concerts that will take place in October, December, February, April, May and July. In this concert, favorite Christian hymns, performed in concert arrangements, are interspersed with Jewish and Islamic music, celebrating the three major religions that share the same origin. “Nearer My God, To Thee,” alongside two prayers—one Jewish and the other Islamic—highlight the unique spiritual quality inherent in these faiths. Featuring Ann-Stephenson Moe at the organ and an ensemble of brass instrumentalists, the performance features other well-known hymns such as “Simple Gifts,” “A Mighty Fortress is Our God,” and “How Great Thou Art.” Sunday, October 14, 4 p.m., at Church of the Redeemer in Sarasota. • Rejoice!! Artistic Director Joseph Holt celebrates his 10th anniversary as artistic director in a celebratory holiday performance featuring “The King Shall Rejoice,” one of the Handel “Coronation Anthems,” a choral version of the “Nutcracker,” and favorite carols, including a new setting of “Silent Night.” Sunday, December 9, 4 p.m., at First Church in Sarasota. • From the Heart: “A German Requiem” by Johannes Brahms is one of the most inspirational and moving works of the 19th century, celebrating and soothing the living, not the deceased. Paired with William Averitt’s “Over Jordan,” a setting of four gospel and spiritual pieces that contemplate the ecstatic journey into eternity, the concert features soloists Jenny Kim-Godfrey, soprano, and Marcus DeLoach, baritone. Choral Artists will observe its 40th anniversary with this performance. Saturday, February 16, 4 p.m., at First Church in Sarasota. • An Afternoon of Operetta: Celebrate Mother’s Day with lilting melodies from favorite operettas by Jacques Offenbach and Franz von Suppé and a condensed version of “The Pirates of Penzance” by Gilbert & Sullivan. Presented by Artist Series Concerts of Sarasota. Sunday, May 12, 4 p.m., at the Sarasota Opera House. • Sounds of Independence: Celebrate Independence Day with choral fireworks, featuring the Sarasota premiere of Jerry Bilik’s “Independence,” favorite patriotic selections and a setting of “The Midnight Ride of Paul Revere” by René Clausen with the Sarasota Concert Band. Thursday, July 4, 4 p.m., at Sarasota Opera House. 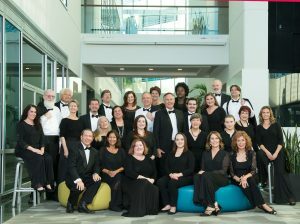 • Peace and Joy: Choral Artists of Sarasota joins forces with Key Chorale for three performances of Beethoven’s “Ninth Symphony” with the Sarasota Orchestra and Anu Tali, conductor. These performances celebrate Tali’s final appearance as music director. Choral Artists will be featured performing Schönberg’s “Friede auf Erden.” Friday, Saturday and Sunday, April 5, 6, & 7, at the Van Wezel Performing Arts Hall in Sarasota. For tickets, visit www.sarasotaorchestra.org.